Edited by RoseKavalier at 19:35, 01 Jun 2018. %*@% tiles if you ask me. Anyway, the problem here is the first path you show is supposed to kill the pathing up north but naturally that got debunked as well. I've been meaning to do this for a while, but I've been busy with other things. I might add some more screenshots in the future. When you start the game, you don't get to keep any resources so pick Artifact as bonus. You can skip pretty much all text, but the summary should be read to get a clue on how to move forward. * avoid Snow tiles at all costs! 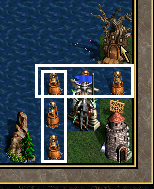 In essence, this leaves us with a single tile to move to. A fight is triggered... it's quite simple and meant as an introduction. Don't get hit twice. Once you win... 65535 Trolls join your army. This is essentially -1, which leaves you with 'no' trolls. There's not much new we can see, let's head back to start. 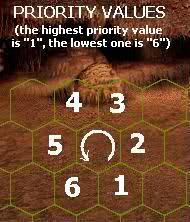 Note heroes travel vertically first and finally diagonally, this will reveal some more ground. A new fight is triggered... we learn a bit about non-positive creatures: they die in one strike and only get 1 turn. After this, they're fodder. The Dread Knight is fast, but it can be tricked in following the wrong target, and then running around in circles while we throw fireball after fireball at it. Some new island is visible! Watch out for Snow traces... better go around. With a Crystal Dragon and Elixir of Life, the upcoming fight is now possible. 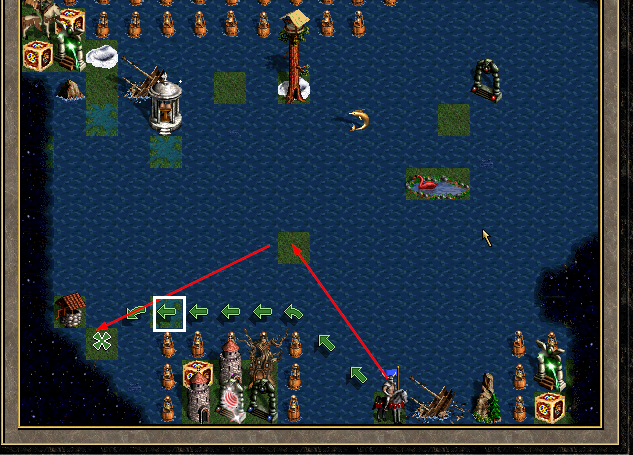 A lot of kiting is needed and smart targeting of enemy to survive. THe Crystal Dragon is now gone, but a Devil takes its place. Or this way. 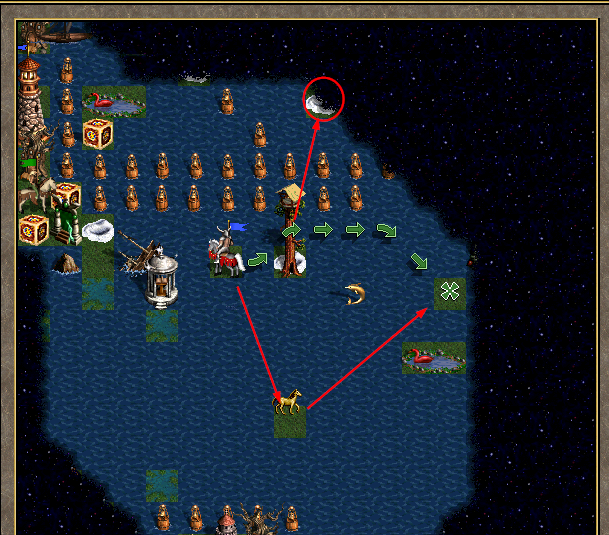 Going this way takes a bit less movement overall considering it will reveal some tiles to the west. Initially the map was designed as a movement puzzle which required the player to optimize the paths taken. This is an artifact of that concept. Eventually I scrapped the idea to make the map slightly more accessible and because it was boring to run around wasting 20,000 movement. This fight is not hard, provided you are able to isolate one stack of Nagas from the other. Devil is replaced with 2 Vampire Lords... visit the newly revealed terrain, still avoiding Swamp terrain. Most readers will by now probably already know the trick of hiding in a corner away from dangerous stacks while weak, non-retaliatory stacks attack your lone stack. This is no different, the only problem is getting there in one piece. Unfortunately we still can't safely reach the 2-way monolith from the start. Visit the Seer Hut and hand over the Elixir of Life... the next fight is calibrated so that you just barely cannot survive a hit whatever you do. We have to outsmart an Angel with only a Troll, and some spell points. I've previously mentioned this in the Metataxer walkthrough.. but the principles behind this puzzle are explained in here. In particular, consider this image which is key to surviving 9 rounds. 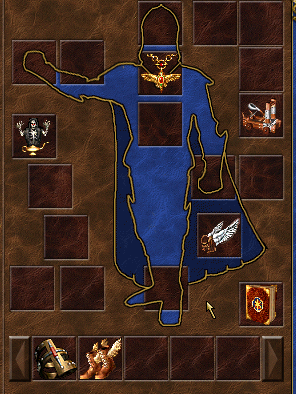 After victory, step on the now freed tile and make your way toward the Monolith. 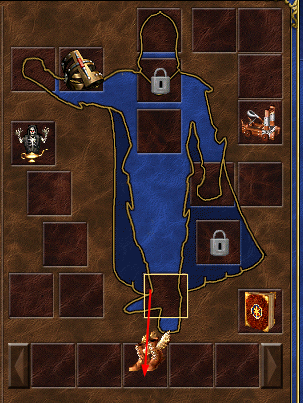 To finish the map in one day, a small trick is required. Step through the portal... because the monolith stands on water, having no boots lets us grab the box without stepping off. An alternative way: use DOWN arrow or NUMPAD2. Any of these will work. You get into a simple kiting exercise with 9 Sprites vs 6 Swords. There are countless setups, but you'll need at least 2 stacks. After the fight, you gain the Angel Wings! Sadly for you, they are just about useless. 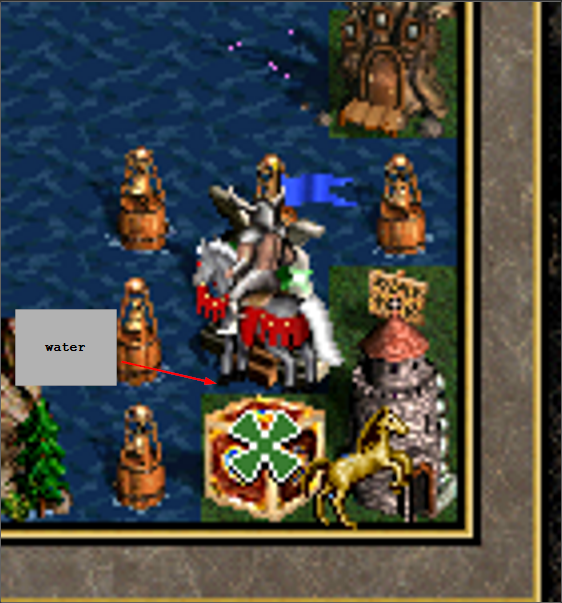 If there's an obstacle with an entrance over a water tile, you cannot fly over it. However, if you want to win on day 1, there's a sequence break here that will test your resolve. Go back up, and open the northern box. 2 Ancient Behemoths vs 10 Sprites and one Peasant. It's not difficult, you just have to think of it and then not misclick for 10 minutes. After the sequence break is done, it's time to head back to the "intended" path. In the initial concept, there was another trick here that required the use of Angel Wings and NUMPAD to save some movement. It's shown in the video for now. The Seer Hut offering Mercury for your Angel Wings is obviously a red herring. While the seer is correct, there is never any mention about timing... so hold on to the Wings a bit longer and use the spacebar trick midflight to stop on top of the one-way Monolith Entrance. Divide and conquer is the theme of the next two fights. Now you have a bunch of spells, but no mana. Continue on, staying clear of snow. 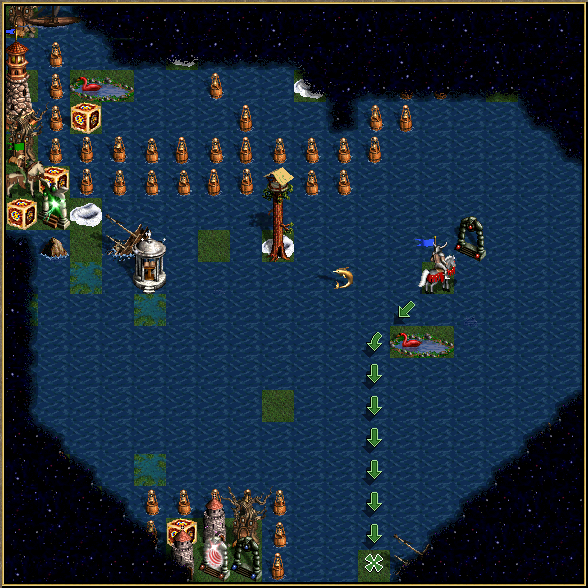 With 1 extra movement point and favorable terrain, it's pretty simple to win here as well. 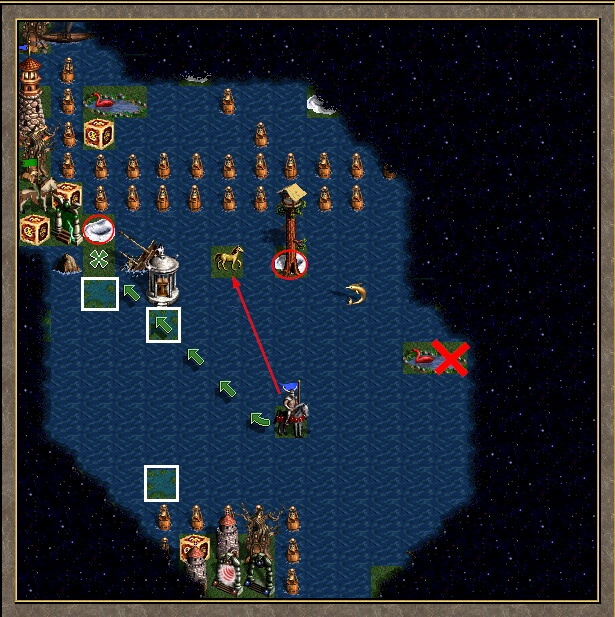 For the next fight, it may look a bit random due to damage ranges, but it's actually quite safe as you can reach the enemy in a single turn by using a 'tight' formation. 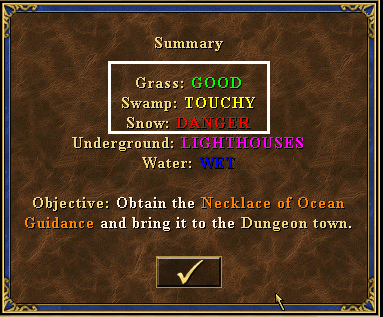 You get Cure for your efforts and a Dungeon town where the Necklace of Ocean Guidance can be brought. The town has some interesting other things to allow alternative victories, it is discussed a bit in the videos. After acquiring the Wyvern, we now also have 8 Secondary Skills - the swamp tiles are no longer dangerous. Visit them all and start approaching Mother Nature, first opening the Pandora's Box to her south. With the spare Peasant, it's a safe fight. 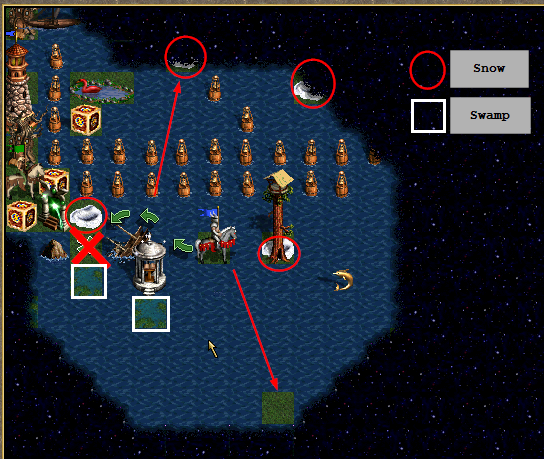 Defeating Mother Nature can be quite tricky if you complete the Titan quest in the bottom right corner of the map. You will need to save up your spell points and use some Clones. Naturally, there's a way faster solution shown in the video. If everything is done correctly, you can finally visit the southern Seer's Hut to collect your 10 Mercury and leave with Town Portal without ever paying any of the Quest Guards... leaving you with 10 spare Mercury to be exchanged at the Market for the missing gold. And that ends the day 1 solution with the latest version of the map, I hope you enjoyed it and maybe learned a thing or two! There are countless setups, but you'll need at least 2 stacks. Tons of interesting tricks in the walkthrough, cheers for taking the time. We need more maps with unique and unusual patterns.